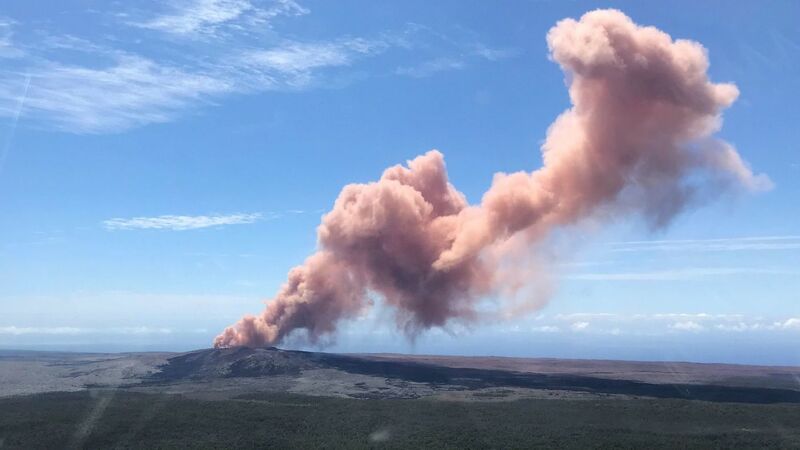 Hawaii’s famed Kilauea volcano underwent a new eruption Thursday that is now threatening neighborhoods with red lava on the eastern edge of Hawaii Island, prompting evacuations. A giant crack about 500 feet long has formed directly in the lower elevation neighborhood of Leilani subdivision. From the crack, lava was shooting up to heights of 100 feet like a fountain, said U.S. Geological Survey volcanologist Wendy Stovall. Residents of the community of Leilani Estates Wednesday reported cracks on the ground, but it was on Thursday that red lava could be seen gushing out of the crack. A lava eruption from Kilauea volcano coming out of a fissure in the ground has not occurred in a residential area since 1960. An eruption and subsequent lava flow in 1960 completely destroyed the town of Kapoho after weeks of efforts to divert lava away from neighborhoods failed. Drone footage broadcast by Hawaii News Now showed a long line of hot lava gushing up into the air out of a long crack in the ground. 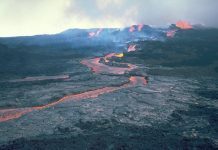 Lava resumed flowing out of Kilauea in 1983, although experts cannot forecast how destructive Thursday’s flow will eventually become. 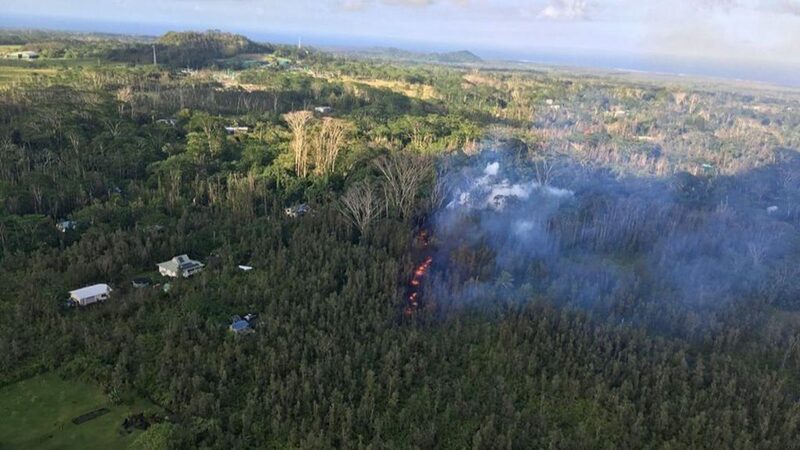 On late Thursday, Stovall said the lava flows erupted for about two hours, and had paused as of about 8 p.m. local time (11 p.m. Pacific time). During that time, lava traveled only about a few yards from the crack in the ground. In 2014, a flow of lava spilled out of the volcano and at one point threatened the town of Pahoa for five months, but the lava flows shut off before the town could be inundated with lava, leaving only a few homes and a waste treatment facility destroyed. Hawaii officials have ordered evacuations for the communities of Leilani Estates and Lanipuna Gardens subdivisons. 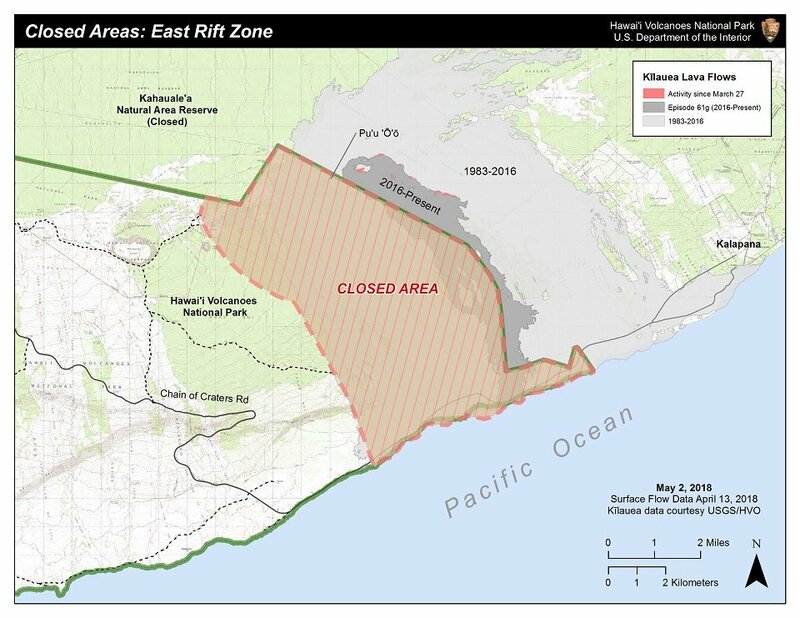 The National Park Service on Wednesday closed nearly 16,000 acres off to the public near the volcano, citing recent instability. The instability began on Monday. Lava has been flowing out of Kilauea from a site on the volcano’s eastern shoulder from the bottom of a crater called Puu Oo since 1983. The crater acted as a reservoir, holding lava as it came up to the surface before it flowed back underground and eventually out to sea. 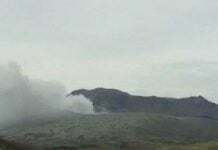 But on Monday, that crater that had acted a reservoir for lava pumping from the depths suddenly collapsed. “The bottom kind of fell out,” Stovall said. Magma then went into a fissure system underground to the east, along the volcano’s eastern section, known as the East Rift Zone, down to the lower elevations. USGS scientists were able to track the new underground path of the magma flowing downhill using a record of earthquake activity, until cracks started to appear in the lower elevations of the volcano’s eastern side, directly into the Leilani subdivision in the area of Mohala Street. After the lava fluid shot up, Stovall said, it fell to the ground and created flows from there. 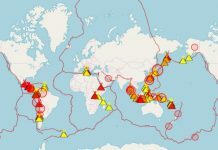 At certain point, everybody has to evacuate while the Earth is in renovation to 5th dimension. People who cannot give up 3rd dimension habit including eating animal carcasses (any kind of meat) have to go to another planet. Some reptilian agents offered to pray for me, but I always refuse their offer because they might contaminate my aura, too. There is a wildfire going on in Texas around Mount Livemore near Fort Davis. Then I found a Youtube video of a bunch of reptilian people on top of the Mt. Livemore. Some of them are shape-shifting into reptilian arm and hand. When you start seeing those people on the video around 0:28, stop the video many times and often. Then you can see the first old guy’s right arm is shape-shifting into reptilian arm.